Healthy alternatives for people who love to indulge in the niceties in life. It has taken a long time and many trial and errors ditched into the garbage bin until now. 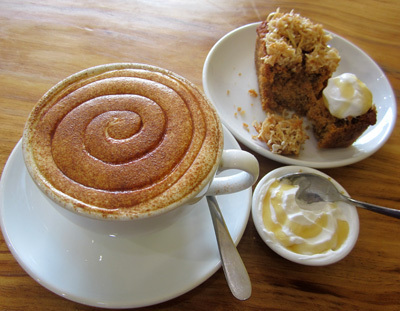 Heart and Soul Cafe in Cronulla offers organic, vegan, gluten free food for a healthy body and tastes sensational. Cinnamon adds a spicy, wooded sweetness to this Chai Latte, a honey swirl delicately floats on top. Gluten free carrot loaf is moist topped with crunchy sweetened coconut. The side of coconut cream is rich and creamy, a perfect accompaniment.